Grab the kids! There are Free Augmented Reality Dinosaurs on the iPad!!! There are many interesting (fun) things being done with Augmented Reality and iPads. Games come alive with 3D graphics rising out of the table with flying bits too. Moving around, the iPad screen shows the same scene from many different angles. To make the Augmented Reality world come alive, a printed graphic must be seen by the app on the iPad to reference. What sets this particular Augmented Reality app apart from the many we see. 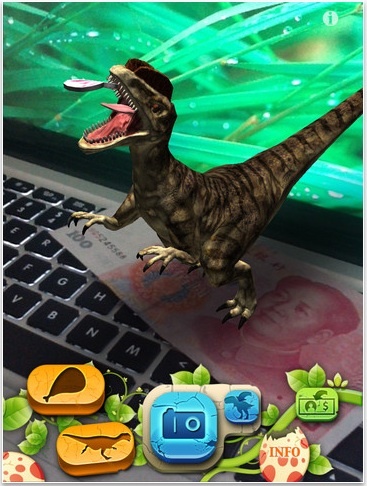 Dinosaurs AR chose to use world money as the item the app sees to key it’s 3D world off of. This means there is no need to carry a special printed card around with you to use the app. 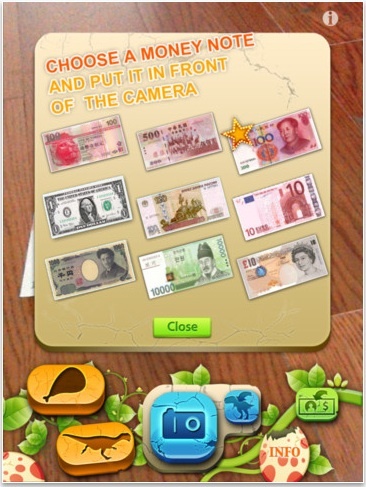 Just pull out a local paper currency, 9 countries supported, launch the app and start having fun. Entertainment for the little ones is always just a iPad away.